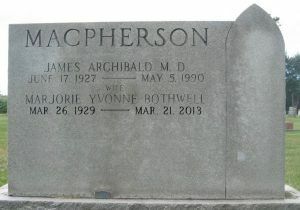 Dr. James Archibald MacPherson was born on the 17th of June, 1927, the son of Dr. John Roy MacPherson and the former Hazel McKillop. He had an older brother named John Donald MacPherson. Dr. MacPherson attended local one-room schoolhouses S.S. #3 and S.S. #4 in Orford Twp., before going to Ridgetown High School and graduating in 1945. 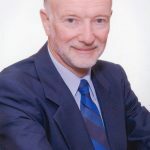 Dr. MacPherson attended medical school at the University of Western Ontario. He graduated M.D. in 1951. Dr. MacPherson was a member of the Delta Upsilon Fraternity and he was an avid soccer player. He interned in St. Thomas at the Ontario Hospital and also at the Hamilton General Hospital. Dr. MacPherson joined his father’s practice in Duart on July 1st, 1952. On the 10th of October, 1953, he married Marjorie “Yvonne” Bothwell. Mrs. MacPherson was a registered nurse who was born in Paris, France on the 26th of March, 1929. Dr. and Mrs. MacPherson had 2 daughters, Janet and Ellen and the MacPherson family resided in Highgate. Like his father, Dr. MacPherson was a Mason and he believed in serving the community. Dr. MacPherson was on the Kent County Hospital Committee and he served a term as the Chairman of the Kent County Board of Health. 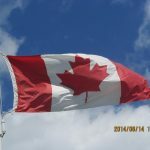 He was a member of the Ridgetown Rotary Club and he served as the President from 1957 to 1958. 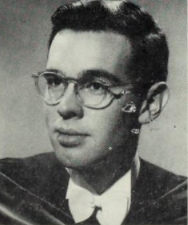 Dr. MacPherson was the President of the Kent County Medical Society in 1969. He enjoyed horse racing and held various positions in the Western Ontario Racing Association. Dr. MacPherson served on the Orford Township Council from 1961 until 1964 and he was the Reeve of Orford Township from 1965-1966. In his spare time, Dr. MacPherson enjoyed stamp collecting, coin collecting and photography. Dr. MacPherson died on the 5th of May, 1990. His wife, Yvonne died on the 21st of March, 2013. They are buried at the Duart Cemetery. 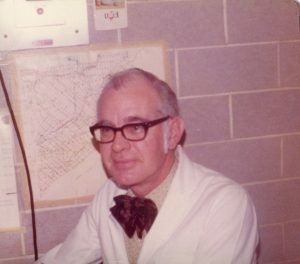 *Dr. MacPherson’s father, Dr. John Roy MacPherson also appears on the Chatham-Kent Physician Tribute website.